Broadband Antenna Tracking Systems, Inc.’s (hereinafter SELLER) Terms and Conditions and order information set forth in this document or incorporated by reference and any modification made pursuant to it shall constitute the complete and exclusive written expression of the terms and conditions of the agreement between the parties, regardless of any conflicting, inconsistent or additional provisions proposed by BUYER, and supersedes all prior or contemporaneous proposals (oral or written), understandings, representations, conditions, warranties, covenants, and all other communications between the parties relating to the subject matter of this contract. 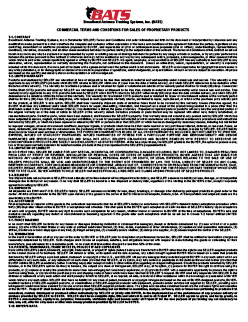 The terms and conditions of this contract as set out herein may not in any way be explained or supplemented by a prior or existing course of dealings between the parties by any usage of trade or custom, or by any prior performance between the parties pursuant to this contract or otherwise and may not be modified in any way by any subsequent orders, proposals, acknowledgments, or other communications which relate to said order, unless specifically agreed in writing by BUYER and SELLER. No agent, employee, or representative of SELLER has any authority to bind SELLER to any affirmation, waiver, representation or warranty concerning the Products, not contained in this document. Unless an affirmation, waiver, representation, or warranty is expressly included within this document, it is not a part of the basis of the agreement between the parties and it is not enforceable. SELLER is not responsible for typographical errors made in any of its publications, or for stenographic or clerical errors made in preparation of quotations, acknowledgments, or specifications. All such errors are subject to correction. All prices are based on the quantity and delivery shown on the quotation or acknowledgment. NONCONFORMING PRODUCTS ARE SOLELY AND EXCLUSIVELY AS STATED HEREIN. At the time of purchase, the SELLER grants to the BUYER, the option to procure a one, two or three years warranty extension for selected custom products at the prices specified in the SELLER’s proposal/contract. IN NO EVENT WILL SELLER BE LIABLE FOR ANY SPECIAL, INCIDENTAL OR CONSEQUENTIAL DAMAGES INCLUDING, BUT NOT LIMITED TO, DAMAGES RESULTING FROM LOSS OF PROFIT OR REVENUE, INSTALLATION OR REMOVAL COSTS OR COSTS OF SUBSTITUTE PRODUCTS. BUYER AGREES THAT ANY BASIS FO R IMPOSING ANY LIABILITY ON SELLER FOR PROPERTY DAMAGE, PERSONAL INJURY, OR DEATH, OR LEGAL EXPENSES RELATING TO THE SALE OR USE OF SELLER’S PRODUCTS SHALL BE VOID AND UNENFORCEABLE TO THE EXTENT NOT PROHIBITED BY LAW. THE TOTAL LIABILITY OF SELLER ON ANY C LAIM, WHETHER IN CONTRACT, TORT (INCLUDING NEGLIGENCE) OR OTHERWISE, ARISING OUT OF, CONNECTED WITH OR RESULTING FROM THE MANUFACTURE, SALE, DELIVERY, RESALE, REPAIR, REPLACEMENT OR USE OF ANY PRODUCT WILL NOT EXCEED THE PRICE PAID FOR THE PRODUCT OR PART THEREOF WHICH GIVES RISE TO THE CLAIM. BUYER AGREES TO HOLD SELLER HARMLESS FROM ALL LIABILITIES AND CLAIMS ARISING FROM USE OF SELLER’S PRODUCT. The shipment date set out herein is SELLER’s best estimate of the time material will be shipped from its factory, and SELLER assumes no liability for loss, damage, or consequential damages due to delays for any reason. In no way shall SELLER be bound to a firm shipment or delivery date, regardless of the wording in the BUYER’s order, except if expressly agreed to in writing by SELLER. All shipments are EXW and F.O.B. SELLER’s factory. SELLER assumes no liability for loss, delay, breakage, or damage after delivering packaged products in good order to the carrier. All risks of loss transfer to the BUYER upon delivery of the goods to the carrier at BATS Offices in Indianapolis, Indiana, USA. All transportation and shipment costs are the sole liability of the BUYER. Final acceptance or rejection of the goods to the contractual requirements shall be at SELLER’s factory in accordance with SELLER’s standard factory acceptance procedure within thirty (30) days after written notice to BUYER of acceptance test schedule. Title shall pass to the BUYER upon acceptance of each line item at SELLER’s factory. Upon acceptance of each unit of goods, BUYER waives any right to revoke such acceptance for any reason, whether known or unknown to BUYER at the time of acceptance. BUYER’s sole and exclusive remedy regarding any defect or nonconformance becoming apparent in the goods after such acceptance shall be as set out in Clause T-2 hereof entitled LIMITED WARRANTY. In no event shall SELLER be liable for any losses or damages (including incidental or consequential damages), delays or defaults occasioned by: (1) acts of God or of a public enemy, (2) acts of the United States or any state or political subdivision thereof, (3) fires, floods, explosions or other catastrophes, (4) epidemics and quarantine restrictions, (5) strikes, slowdowns or labor stoppages of any kind, (6) freight embargoes, (7) unusually severe weather, (8) delays of a supplier, or (9) causes beyond the control of the SELLER. In the event of termination of all or any part of the order by BUYER or SELLER prior to completion of performance hereunder, SELLER shall be entitled to termination charges as reasonably determined by SELLER. Such charges shall include all expenses, liabilities, and obligations incurred with respect to manufacturing the goods or contracting for their manufacture, plus allowance for a reasonable profit. In no event shall termination charges be less than 50% of the order. None of the SELLER’s patent, trademark, copyright, trade secret, or project IP rights (defined below) are transferred to BUYER other than the right to use SELLER-supplied products in the normal course of its business. SELLER will defend or settle, at its option and its sole expense, any action brought against BUYER that is based on a claim that products furnished by SELLER infringe a product patent, trademark or copyright of the U. S., and SELLER will pay any damages finally awarded against BUYER in any such action which are attributable to any such claim, or any settlement of such claim provided that SELLER, at its option, may fully control or participate in the defense thereof and further provided that BUYER notifies SELLER immediately (within 3 working days) after receipt of notice or other information regarding an alleged infringement. Should the products furnished by SELLER become, or in the SELLER’s opinion be likely to become, the subject of a claim of infringement, SELLER may, at its option, (1) procure for BUYER the right to continue using the products, or (2) replace or modify the products to make them non-infringing but functionally equivalent, or (3) provide BUYER with a reasonable opportunity to procure the right to continue using them, or (4) refund the purchase price and shipping costs of items which have been returned at SELLER ‘s request. BUYER shall fully cooperate with SELLER in the defense or settlement of any such action and shall promptly furnish to SELLER, at its request, all data, records and other assistance within the knowledge or possession of BUYER which relate to any such action. SELLER shall have no liability for any claim of patent, trademark or copyright infringement based on the use of BUYER-designed products, BUYER- modified versions of SELLER-supplied products, or combinations of SELLER-supplied products with equipment, products and/or services not supplied by SELLER, providing such infringement would have been avoided by the use of unmodified SELLER-supplied products alone. The rights and remedies contained herein are the exclusive rights and remedies of the BUYER. Project IP shall include all intellectual property, including but not limited to inventions, designs, software, data or know how pertaining to products first conceived, created, developed or produced either individually by SELLER or jointly with BUYER, in the implementation of the performance of any product delivery or services provided by SELLER to BUYER. SELLER shall have complete right, title and interest in and to all Project IP. SELLER agrees to grant, and herby grants, to BUYER a non-exclusive, royalty-free, perpetual, irrevocable, worldwide right and license under all Project IP for the sole purpose of performing any act necessary to test, use, sell, offer for sale, lease or otherwise convey products provided by SELLER to BUYER. BUYER agrees that all data furnished in conjunction with its order together with any information furnished orally shall be free from proprietary or confidentiality restriction except as otherwise agreed in writing by SELLER. The prices and quantities set out herein represent the quantity information contained in BUYER’s order to SELLER, and SELLER’s agreed-to-price therefore, and shall be controlling. In case of dispute, both parties shall in good faith seek to reach agreement in accord with the original agreed-to-order. With regard to long term supply contracts (one-year or longer) SELLER reserves the right and BUYER and SELLER agree to enter into good faith negotiations to annually adjust prices based upon the prevailing economic conditions. SELLER reserves the rights to over or under ship the quantities specified on BUYER’s order by 5% for any products other than those that are standard. BUYER agrees to accept such over or under shipment as complete shipment. BUYER shall be invoiced for quantities actually shipped. BUYER agrees to pay all applicable federal, state and local revenue, excise, sales, use or similar taxes, based on this order, or in lieu thereof, BUYER shall provide SELLER with a suitable tax exempt certificate acceptable to the taxing authorities. Any changes by BUYER relating to the work to be performed, method of shipment or packing, schedule, or place of delivery must be made by written order to SELLER. If such changes cause an increase or decrease in the cost of performance or in the time required for performance, SELLER shall be entitled to an equitable adjustment and the contract shall be modified accordingly prior to implementation of the change. Payment is due prior to shipment (International Sales) or upon the earlier of delivery of goods to the FOB point or net thirty (30) days from the date of invoice, unless otherwise specified on the invoice. Reserved acceptance at destination is not deemed to be a precondition for payment. Each shipment shall be considered a separate and independent transaction and therefore payment shall be made accordingly without any set off. If shipments are delayed by or at the request of BUYER, BUYER agrees to make payments net thirty (30) days from the date when the SELLER is prepared to make shipment. Some form of mutually agreeable advance/milestone payment schedule must be agreed upon and included in the contract award for orders with an aggregate total of $100,000.00 or more. Amounts outstanding and unpaid beyond the time specified in these terms may, at the sole discretion of the SELLER, accrue interest and such interest shall accrue on a day-to-day basis until payment is made in full. Orders for custom or special products and/or services are irrevocable and will require advance payment. Failure of BUYER to make payments shall be grounds for SELLER to delay shipment, place the BUYER on Credit Hold or terminate the contract in whole or in part. SELLER shall not be obligated to provide a letter of credit or other form of contract guarantee for payments received prior to final delivery. Neither this contract nor any interest herein may be assigned by BUYER either voluntarily or by operation of law without the prior written consent of SELLER. No consent shall be deemed to relieve BUYER of its obligations to fully comply with the requirements hereof. SELLER may, without BUYER’s consent, assign any monies due or to become due hereunder. This contract shall be governed by and construed and enforced exclusively according to the Laws of the State of Indiana, without regard to the conflicts of law principles thereof. Orders canceled by BUYER will be subject to a cancellation charge at SELLER’s discretion. All orders are subject to credit approval and will be shipped only after credit has been approved by SELLER. To establish an open account, three domestic trade references and one bank reference is required. Final credit approval is at the sole discretion of SELLER. No merchandise will be accepted for return without written authorization. All returns must be unused, undamaged, in the original factory carton, and accompanied by a “Return Material Authorization (RMA) number and a copy of the SELLER invoice. Restocking charges apply to returned goods depending upon the circumstances of return and condition of product. All returned goods must be shipped prepaid, insured, and properly packed and the RMA number must be referenced on all correspondence and must be visible on the exterior of the carton. In the event that the contract provides for CFM, CFE, or CFI, such items must be provided in a timely manner, be free from defects, and be fully functional and/or useable. Any costs incurred by SELLER to bring the CFM or CFE to a fully operational and useable condition or costs incurred in connection with defective CFI are additional to the price and are subject to separate negotiation and will be deemed to be a change pursuant to the clause T-12 entitled “CHANGES” and will entitle SELLER to an equitable adjustment to the price and/or delivery schedule, as applicable. The price does not include repair or retrofit costs for CFM or CFE and said costs are additional to the price and are subject to separate negotiation. If CFM, CFE or CFI is delayed in delivery to SELLER in performance of any accepted purchase order, SELLER shall invoice BUYER on the original scheduled delivery date as if the finished products were delivered and accepted by BUYER. Payment shall be due under the same terms and conditions of the original purchase order from the original scheduled delivery date. SELLER shall still be required to deliver to BUYER products as quickly as possible once CFM, CFE or CFI is received by SELLER. BUYER, at its own expense, agrees to comply with all laws and regulations of the United States related to exports, imports and foreign transactions, including, but not limited to, the International Traffic in Arms Regulations (ITAR) (22 C.F.R. §§ 120-130 inclusive of subsections 122.1 “Registration Requirements”, 123.22 “Filing, retention, and return of export licenses and filing of export information” and the Export Administration Regulations (EAR) (15 C.F.R §§ 730-774). SELLER grants to BUYER a non-exclusive and non-transferable single user license to use the BATS Software/System in object code form solely on equipment provided by SELLER. BUYER’S license to use the software shall be limited to, and BUYER shall not use the software in excess of, each hardware chassis or such other limitations in the SOFTWARE/SYSTEM LICENSE AGREEMENT and/or applicable purchase order which has been accepted by SELLER and for which BUYER has paid SELLER. BUYER agrees that aspects of the Software/System, including the specific design and structure of individual programs and hardware constitute trade secrets, proprietary or confidential information and/or copyrighted material of SELLER. BUYER agrees not to disclose, provide or otherwise make available such trade secrets, confidential information or copyrighted material in any form to any third party without the prior written consent of SELLER. BUYER agrees to implement reasonable security measures to protect such trade secrets, confidential information and copyrighted material. Title to Software/Systems and documentation shall remain solely with SELLER. EXCEPT AS EXPRESSLY AUTHORIZED BY SELLER, BUYER SHALL NOT COPY, IN WHOLE OR IN PART, SOFTWARE/SYSTEM OR DOCUMENTATION; MODIFY THE SOFTWARE/SYSTEM; DECOMPILE, DISASSEMBLE, REVERSE ENGINEER OR OTHERWISE ATTEMPT TO DISCOVER ANY SOURCE CODE OR UNDERLYING ALGORITHMS OF ALL OR ANY PORTION OF THE SOFTWARE/SYSTEM; OR RENT, LEASE, DISTRIBUTE SELL OR CREATE DERIVATIVE WORKS OF THE SOFTWARE/SYSTEM. CUSTOMER AGREES THAT ANY OF THE FOREGOING UNAUTHORIZED ACTS WILL DAMAGE BATS AND THAT THE PRECISE AMOUNT OF SUCH DAMAGES IS DIFFICULT OR IMPOSSIBLE TO CALCULATE. ACCORDINGLY, CUSTOMER AGREES THAT IN ADDITION TO ANY OTHER REMEDIES AVAILABLE TO BATS, COMMISSION OF ANY OF THE UNAUTHORIZED ACTS WILL ENTITLE BATS TO LIQUIDATED DAMAGES IN THE AMOUNT OF $100,000 PER OCCURANCE. BATS SHALL ALSO BE ENTITLED TO ITS REASONABLE ATTORNEYS’ FEES AND COSTS ASSOCIATED WITH ENFORCING ITS RIGHTS. SELLER reserves the right to make changes in design, at any time, without incurring any obligations to provide same on units previously purchased or to continue to supply obsolete units or parts. If any provision of this contract is found by a court of competent jurisdiction or an arbitrator to be unenforceable or invalid, the unenforceability or invalidity will not render this contract unenforceable or invalid as a whole; rather, this contract will be construed as if not containing the particular invalid or unenforceable provision or portion thereof, and the rights and obligations of the Parties hereto will be construed and enforced accordingly. In that event, the Parties will negotiate in good faith a replacement provision that would best accomplish the objectives of the unenforceable or invalid provision within the limits of applicable law or applicable court decisions The failure of either party to insist, in any one or more instances, upon the performance of any term or terms of this order shall not be construed as a waiver or relinquishment of that party’s right to such performance or to future performance of such a term or terms, and the other party ‘s obligation in respect thereto shall continue in full force and effect. SELLER specifically rejects and objects to BUYER issuance of any unilateral order not in full compliance and agreement with these SELLER Terms and Conditions of Sale, except if expressly agreed to in writing by SELLER. SOLE DEAL REGISTRATION opportunities are defined as opportunities that a partner has identified, qualified, and registered, which is not on an existing BATS sales forecast or has not been identified by another BATS partner. This can be an opportunity with a net new customer or a net new solution with an existing customer. These opportunities qualify for upfront discount protection and exclusive letters of support (where applicable). KEY DEAL REGISTRATION provides partners with the ability to register deals that are not incremental but where the partner is still providing what BATS considers to be ‘key value’ to that opportunity or project. In the event that a Sole Deal Registration status has expired or is found not to be incremental, partners can again apply for Sole Deal Registration. For example, it may be an opportunity that BATS knows about but the partner is providing the Proof-of-Concept (POC) and other services for the customer. If a current Sole Deal Registration exists, partners who do not hold a valid Key Deal Registration approval will not be eligible for letters of support under the Deal Registration process. While Key Deal Registration does qualify for partner letters of support, it does not qualify for top level upfront discount. If an RFP is submitted for Deal Registration, it will always be approved as a Key Deal Registration, open to any confirmed partner that registers the deal. Both Sole and Key Deal Registrations are submitted on the BATS portal for review, status determination, and approval by BATS. If approved under Sole status, this entitles the partner to be the sole recipient for any additional discounting for that opportunity alone. Sole and Key Deal Registration applies for 180 days. Re-registration is available and is subject to approval from BATS. Please Note: All existing partners signed up under the Key Deal Registration Scheme are eligible for letters of support for that opportunity alone. If it is found that another partner has secured Sole Deal Registration, the Sole Deal partner will receive additional discounting above Regular and Key levels. 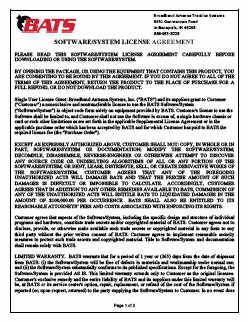 PLEASE READ THIS SOFTWARE/SYSTEM LICENSE AGREEMENT CAREFULLY BEFORE DOWNLOADING OR USING THE SOFTWARE/SYSTEM. BY OPENING THE PACKAGE, OR USING THE EQUIPMENT THAT CONTAINS THIS PRODUCT, YOU ARE CONSENTING TO BE BOUND BY THIS AGREEMENT. IF YOU DO NOT AGREE TO ALL OF THE TERMS OF THIS AGREEMENT, RETURN THE PRODUCT TO THE PLACE OF PURCHASE FOR A FULL REFUND, OR DO NOT DOWNLOAD THE PRODUCT. Single User License Grant: Broadband Antenna Systems, Inc. (“BATS”) and its suppliers grant to Customer (“Customer”) a nonexclusive and nontransferable license to use the BATS Software/System (“Software/System”) in object code form solely on equipment provided by BATS. Customer’s license to use the Software shall be limited to, and Customer shall not use the Software in excess of, a single hardware chassis or card or such other limitations as are set forth in the applicable Supplemental License Agreement or in the applicable purchase order which has been accepted by BATS and for which Customer has paid to BATS the required license fee (the “Purchase Order”). EXCEPT AS EXPRESSLY AUTHORIZED ABOVE, CUSTOMER SHALL NOT: COPY, IN WHOLE OR IN PART, SOFTWARE/SYSTEM OR DOCUMENTATION; MODIFY THE SOFTWARE/SYSTEM; DECOMPILE, DISASSEMBLE, REVERSE-ENGINEER OR OTHERWISE ATTEMPT TO DISCOVER ANY SOURCE CODE OR UNDERLYING ALGORITHMS OF ALL OR ANY PORTION OF THE SOFTWARE/SYSTEM; OR RENT, LEASE, DISTRIBUTE, SELL, OR CREATE DERIVATIVE WORKS OF THE SOFTWARE/SYSTEM. CUSTOMER AGREES THAT ANY OF THE FOREGOING UNAUTHORIZED ACTS WILL DAMAGE BATS AND THAT THE PRECISE AMOUNT OF SUCH DAMAGES IS DIFFICULT OR IMPOSSIBLE TO CALCULATE. ACCORDINGLY, CUSTOMER AGREES THAT IN ADDITION TO ANY OTHER REMEDIES AVAILABLE TO BATS, COMMISSION OF ANY OF THE UNAUTHORIZED ACTS WILL ENTITLE BATS TO LIQUIDATED DAMAGES IN THE AMOUNT OF $100,000.00 PER OCCURRENCE. BATS SHALL ALSO BE ENTITLED TO ITS REASONABLE ATTORNEYS’ FEES AND COSTS ASSOCIATED WITH ENFORCING ITS RIGHTS. Customer agrees that aspects of the Software/System, including the specific design and structure of individual programs and hardware, constitute trade secrets and/or copyrighted material of BATS. Customer agrees not to disclose, provide, or otherwise make available such trade secrets or copyrighted material in any form to any third party without the prior written consent of BATS. Customer agrees to implement reasonable security measures to protect such trade secrets and copyrighted material. Title to Software/System and documentation shall remain solely with BATS. BATS warrant that the Software/System is error free or that Customer will be able to operate the Software/System without problems or interruptions. This warranty does not apply if the Software/System (a) has been altered, except by BATS, (b) has not been installed, operated, repaired, or maintained in accordance with instructions supplied by BATS, (c) has been subjected to abnormal physical or electrical stress, misuse, negligence, or accident, or (d) is used in ultra hazardous activities. BEEN ADVISED OF THE POSSIBILITY OF SUCH DAMAGES. In no event shall BATS’s or its suppliers’ liability to Customer, whether in contract, tort (including negligence), or otherwise, exceed the price paid by Customer. The foregoing limitations shall apply even if the above-stated warranty fails of its essential purpose. The above warranty DOES NOT apply to any beta Software/System, any Software/System made available for testing or demonstration purposes, any temporary Software/System modules or any Software/System for which BATS does not receive a license fee. All such Software/System products are provided AS IS without any warranty whatsoever. This License is effective until terminated. Customer may terminate this License at any time by destroying all copies of Software/System including any documentation and providing BATS written verification of such destruction. This License will terminate immediately without notice from BATS if Customer fails to comply with any provision of this License. Upon termination, Customer must destroy all copies of Software/System and provide BATS prompt written verification of such destruction. Software/System, including technical data, is subject to U.S. export control laws, including the U.S. Export Administration Act and its associated regulations, and may be subject to export or import regulations in other countries. Customer agrees to comply strictly with all such regulations and acknowledges that it has the responsibility to obtain licenses to export, re-export, or import Software/System. This License shall be governed by and construed in accordance with the laws of the State of Indiana, United States of America, as if performed wholly within the state and without giving effect to the principles of conflict of law. If any provision of this License is found by a court of competent jurisdiction or an arbitrator to be unenforceable or invalid, the unenforceability or invalidity will not render this License unenforceable or invalid as a whole; rather, this License will be construed as if not containing the particular invalid or unenforceable provision or portion thereof, and the rights and obligations of the Parties hereto will be construed and enforced accordingly. In that event, the Parties will negotiate in good faith a replacement provision that would best accomplish the objectives of the unenforceable or invalid provision within the limits of applicable law or applicable court decisions. This License constitutes the entire agreement between the parties with respect to the use of the Software/System. Restricted Rights – BATS’s Software/System is provided to non-DOD agencies with RESTRICTED RIGHTS and its supporting documentation is provided with LIMITED RIGHTS. Use, duplication, or disclosure by the Government is subject to the restrictions as set forth in subparagraph “C” of the Commercial Computer Software/System – Restricted Rights clause at FAR 52.227-19. In the event the sale is to a DOD agency, the government’s rights in Software/System, supporting documentation, and technical data are governed by the restrictions in the Technical Data Commercial Items clause at DFARS 252.227-7015 and DFARS 227.7202. Manufacturer is Broadband Antenna Tracking Systems, Inc. 8431 Georgetown Road, Suite 600, Indianapolis, IN 46268.